Gold Georgian antique mourning ring in memory of Mary Ann Edmonds 1806-1822: Description par door Adin Bijoux Anciens. This is a so-called memorial ring. From the mid 1700's till the early 1800's the well-to-do would predestinate a certain part of their financial legacy to have these memory-rings made, once they passed away. In their testament they would clearly stipulated who would get such ring. These rings were then worn by their heirs in memory of their beloved deceased. 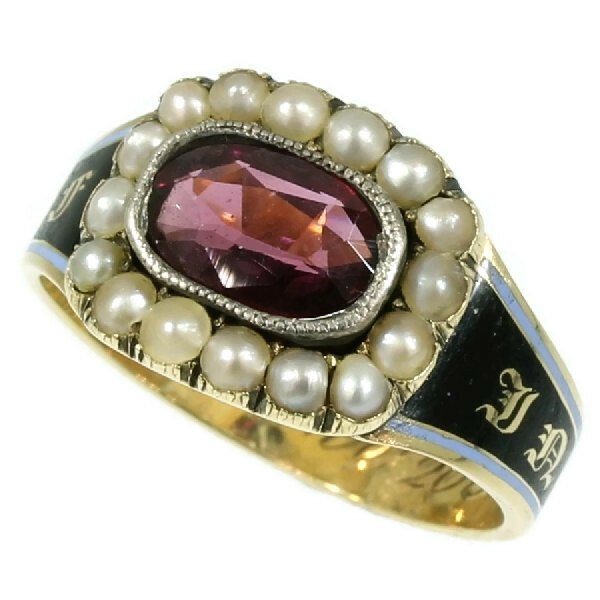 On the outside of the shank (bottom part of ring) we can read in Gothic letters: "IN MEMORY OF", and on the inside the ring has been hand engraved with: "Mary Ann Edmonds, 06, 26 Jan, 1822 Oct 19 "
The outer text "IN MEMORY OF", is a generic text that is enameled, and the personalisation on the inside is hand engraved. From this we can conclude that rings like this could be choosen at the local jewelry store and only personalized (by hand engraving) after purchasing. Country of origin: Although it does not carry any legible control marks we believe this to be of British origin. Theme: Mourning jewels - At that time there was actually a jewel for every stage of the mourning period. Mourning - Mourning is, in the simplest sense, synonymous with grief over the death of someone. The word is also used to describe a cultural complex of behaviours in which the bereaved participate or are expected to participate. Customs vary between different cultures and evolve over time, though many core behaviors remain constant. Wearing dark, sombre clothes and jewelry is one practice followed in many countries, though other forms of dress are also seen. The colour of deepest mourning among medieval European queens was white rather than black. Birthstones: Garnet is the birthstone (or month stone) for January and pearl for June.